Richard The Third Takes You To The Biscope! Richard The Third is a really busy dude when it comes to making awesome music. He dropped me a mail with the details of a mix he did for a project of his under the name of “Biscope”! So now we have even more proof that Cape Town is definitely taking the lead when it comes to dubstep in South Africa! 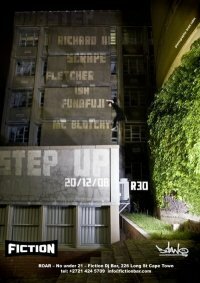 Fiction, on Long Street, Cape Town, hosts a monthly dubstep party called “Step Up!” and you are sure to catch Richard The Third dropping some great tunes in some shape or form. The Step Up! parties have a Facebook group, so why not join it and stay in the loop? Link to the group here! Grab a link to Richard’s “Biscope – Step Forward” mix as well as tracklisting after the jump! To download this mix click here! Just a note: This is not a live mix, it is a made at home version of the live mix he played at Fiction for one of the Step Up! parties. The last track of the mix “Moleke Mbembe – War on Words” is yet another project that Richard has started, this time it is with Spoek Mthambo… so stay tuned for more! Thanks Richard for dropping this off in my inbox!